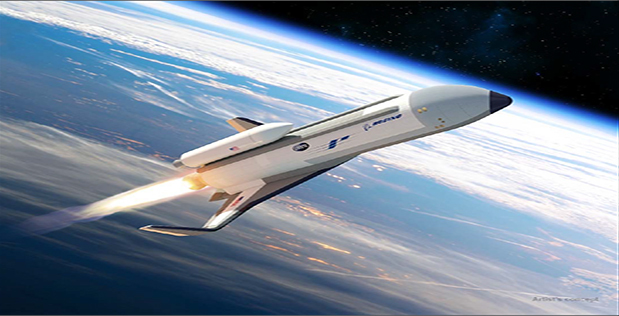 May 24, 2017 – Boeing and the U.S. Defense Advanced Research Projects Agency (DARPA) are collaborating to design, build and test a technology demonstration vehicle for the Experimental Spaceplane (XS-1) program. Boeing will develop a reusable autonomous spaceplane, roughly the size of a business jet, which will take off vertically like a rocket and fly to hypersonic speeds. The vehicle will be launched with no external boosters, powered solely by self-contained cryogenic propellants. Once the spaceplane – called Phantom Express – reaches the edge of space, the booster will release an expendable upper stage able to deploy a 3,000-pound satellite to polar orbit. The reusable first stage will then bank and return to Earth, landing horizontally like an aircraft, and be prepared for the next flight, potentially within hours. The program aims to achieve a capability well out of reach today — launches to low Earth orbit in days, as compared to the months or years of preparation currently needed to get a single satellite on orbit.